I know safety chains are a pain to use especially with gooseneck trailers. I was born and raised in Colorado and about half of my friends don’t use them. But chains do have a purpose. 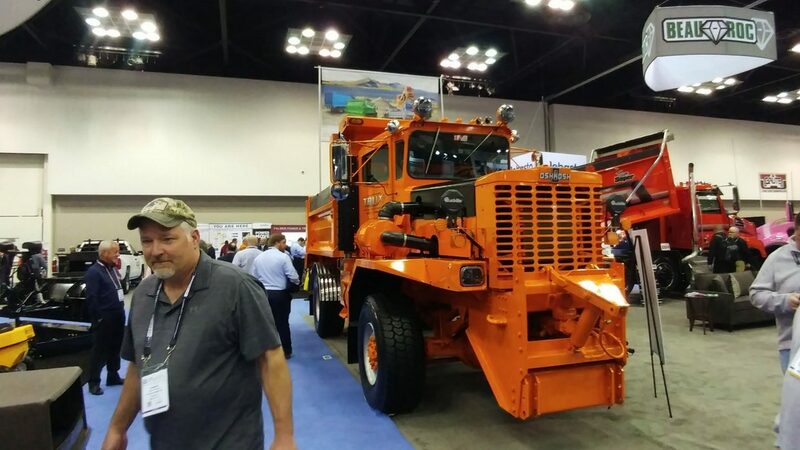 The RV industry and Commercial Trucking industry have lobbied to not require safety chains for 5th wheel trailers. But us horse folk don’t have lobbiest in Washington so guess what, it is the law in most states to use safety chains when towing ball trailers. A few decades ago some of our Colorado trailers where grandfathered in similarly to CDL license from Class A. Among the friends I have that use safety chains, we all have our near miss stories. My story happened in Kansas. 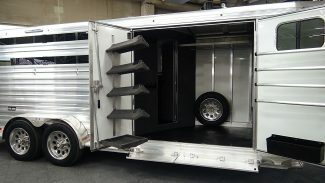 I just loaded some new hitch displays from Popup Industries for my horse expo tour in my gooseneck trailer. I was towing doubles so I had unhooked my bumper pull trailer to load the gooseneck trailer. When I reconnected the bumper pull trailer to the rear of my gooseneck trailer, I was certain I had the coupler latched and locked, safety chains in place and the plug connected. It was raining of course and after traveling a few miles, I noticed the bumper pull trailer was weaving back and forth. Then it dawned on me that the trailer was moving farther than possible if it was hooked up. I grabbed my in cab trailer brake controller manual lever and braked the trailers separately from the truck. This straightened out the second trailer. And I was able to move over to the side of the road, holding on to the manual lever keeping the trailers under control. My bumper pull trailer had come off the coupler, the safety chains where still connected and my wire plug. The trailer jack was all the way up which was good, so I just had a few scuff marks on the trailer tongue. My guess is the coupler wasn’t totally connected, the pin was missing, so the jury is still out if I inserted the pin and it bounced out or someone forgot to insert the pin. I am a test dummy after all. Someone has to learn the hard lessons and report the story. Without the safety chains, the trailer would have escaped and maybe hit someone driving behind me. With the safety chains, no one was hurt and my trip wasn’t ruined. Having the safety chains allowed me to get control of the trailer with my trailer brake controller and get the rig off the road. I hear often, that “ if the trailer comes off the coupler, I don’t want to be hooked to it” but I doubt if the folks driving behind you want to be hooked to it either and they have no chance of controlling the trailer then it comes flying back at them. Look at the safety of safety chains as part of a three step system. Most trailer accidents are from using the wrong size ball or and unlatched coupler. 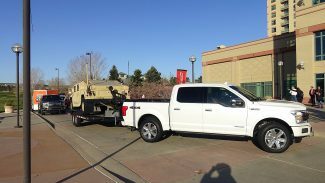 If the coupler becomes disconnect from the truck/SUV ball, the trailer slides back and the safety chains stop the rearward journey. 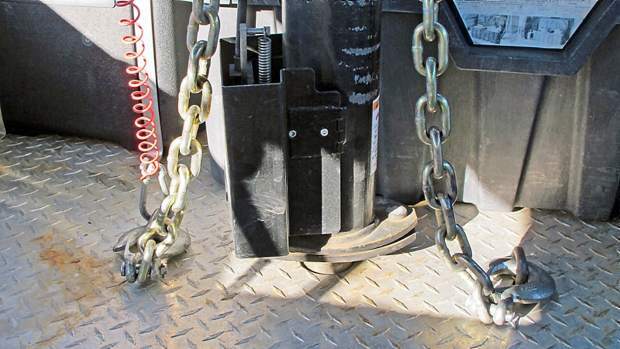 Crossing your safety chains can help cradle the coupler. This is where you use the manual lever on the trailer brake controller to slow down the trailer separate from the truck. This will pull the trailer straight behind the truck allowing you to move over out of traffic. The third step is if the safety chains break, then you have no control and the break-way cable will trip and lock the trailer brakes for 15 minutes. 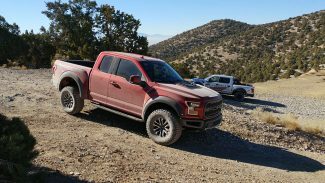 This is to stop the trailer so folks can swerve around it and you have those 15 minutes to find a rock to brace the trailer tires so the trailer doesn’t roll when the break-away brake battery runs out. It’s a good idea to take your truck and trailer to an empty parking lot and practice using the trailer brake controller manual lever to slow down your trailer. Don’t forget to check your trailers break-away battery for a full charge. I might be the guy driving behind you when things go wrong.